Recently I had the opportunity to attend an author talk at the local library featuring historical fiction writer Elizabeth Kostova. 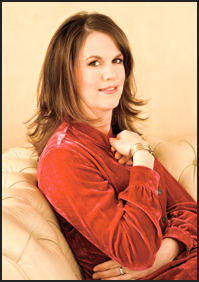 Her first book The Historian was published in 2005 and became the first debut novel to enter the New York Times bestseller list at #1. It went on to win the American Booksellers Foundation’s Book Sense award for Best Adult Fiction and Kostova took home the 2005 Quill Award for Debut Author of the Year. In town to promote her latest novel, Kostova read a chapter from The Swan Thieves and answered audience questions with warmth and humour. Reading from chapter twelve, she shared the story behind it of the unusual first meeting of her friend’s parents, who met at the bottom of an escalator in Nebraska when she threw up on his shoes. It was a meeting she had always wanted to use in a book. Kostova went on to answer audience questions, discussing her particular love of nineteenth century writers. Her favourite among those is Henry James, but she also mentioned noted Victorian novelists Thomas Hardy and Wilkie Collins. Unlike many historical fiction writers, who set their stories in one era from start to finish, Kostova prefers to incorporate periods of history into novels with a more contemporary setting to look at the impact that history has, or doesn’t have, on individuals in the present. Asked about her historical method, she mentioned researching for The Swan Thieves by reading letters written by artists in the nineteenth century. These gave her an idea of voice. She also researches in libraries and talked to a longtime resident of Istanbul (who had lived there during the fifties) for The Historian, a novel about the search for Vlad Tepes, the historical Dracula. Kostova even tried some of the dishes sampled by her characters in The Historian in order to accurately describe their flavors! Historical accuracy is important to her and it shows. But the best part of the evening for fans of Kostova’s works was the news that she began work in November on a new novel. Unfortunately, we’ll have to wait and see which historical period and region she tackles next. Both the author and the event were throughly enjoyable and the Oakville Public Library did a fantastic job of planning and carrying out the evening. For those interested in hearing more from Ms. Kostova, a podcast of the evening should be available on the Oakville Public Library website soon. 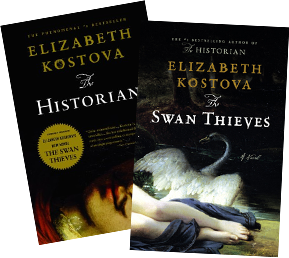 I haven’t read The Swan Thieves yet, but I intend to use it as an entry in the Art History Reading Challenge in the future. I did enjoy The Historian, particularly Kostova’s gift for describing so many diverse locales. Too much detail about landscapes can bog a novel down, a criticism I have of Thomas Hardy’s famous Tess of the D’Urbervilles, but Kostova uses descriptions so effectively that she draws the reader in, making them believe that they are in an Istanbul library or a small town in Romania. With Helen Rossi and Paul she creates distinct and likable characters, although Kostova’s use of multiple narrators may make it difficult to discern whose memories the audience is following. The Historian is a thoughtful new twist on the vampire myth based in its historical origins, and is well worth a read. Very nice review. I enjoyed the evening and found Elizabeth funny, well-spoken and likeable. I also enjoyed Chapter 12 of the Swan Thieves and found it enough of an introduction to make me want to read the book which, I guess, makes Ms. Kostova’s visit a success! At the risk of sounding ridiculously petty, I have to say I was put off by the size of The Historian. Amazon lists it as 900 pages! I had just read Jonathan Strange and Mr. Norrell, which comes in at 1006 pgs, so it wasn’t quite as daunting perhaps, but The Historian is long! My trade paperback copy is 668 pgs.